Michigan State Rep. Aric Nesbitt recently wrote the Federal Energy Regulatory Commission (FERC) to urge the timely approval of the proposed Rover Pipeline. Nesbitt, who serves as the chair of the House Committee on Energy, noted the importance of safely developing regional pipeline infrastructure needed to access low-cost, domestic natural gas. Advances in pipeline infrastructure have ensured that these projects will be undertaken in a responsible manner, with minimal impacts to local communities. Endeavors such as the Rover Pipeline have demonstrated a commitment to safety, with a range of measures employing the latest in pipeline construction and monitoring technologies. Studies have proven time and again that underground pipelines are the safest, most efficient means to bring our nation’s natural resources to market. In addition to providing a safe, efficient means for delivering affordable natural gas resources, pipelines also generate a host of local economic benefits. Specifically, Nesbitt highlighted the thousands of jobs and economic stimulus associated with the construction pipeline infrastructure. The Rover Pipeline, for example, will create up to 10,000 construction jobs in Michigan, Ohio, West Virginia, and Pennsylvania. Wages paid will go on to support hardworking men and women and their families. Additionally, these workers will purchase goods and services from local businesses along the construction route, generating income for another layer of community members. 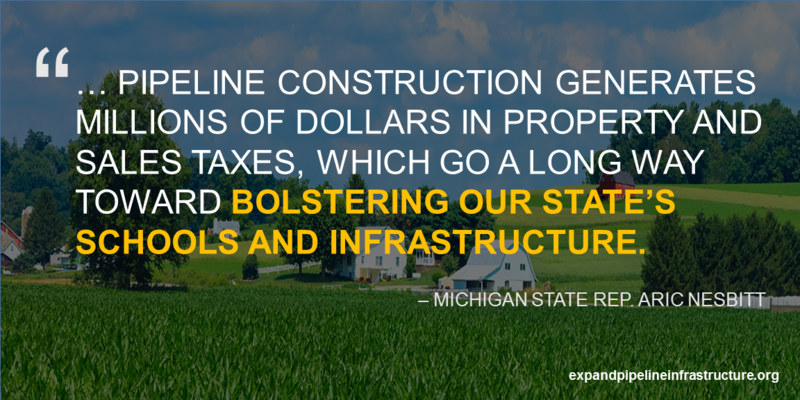 Not to mention, pipeline construction generates millions of dollars in property and sales taxes, which go a long way toward bolstering our state’s schools and infrastructure. In writing to FERC, Nesbitt joins a growing group of elected officials who recognize the importance of modernizing our regions natural gas pipeline infrastructure. Read Rep. Nesbitt’s full letter here.